How has the banking system changed in the last 5 years? Since only 4 banks have total assets of over $ 10 billion at the end of 2013, there have been 11 banks by 2018 - all of which are very influential banks when the market share of deposits and credit accounts for more than 2. / 3 markets. Only in the last 5 years, the scale of Vietnam's credit institution system has increased significantly. From the total assets of more than 5.7 million billion at the end of 2013, by the end of 2018, this figure has surpassed the 11 million billion mark, nearly doubling after 5 years. Total assets of the system are concentrated in state-owned commercial banks (44%), followed by joint-stock commercial banks (41%). Total assets of joint-venture banks and foreign banks account for only 10%. The remaining 3% are from other types of credit institutions such as finance companies, financial leasing, cooperative banks, social policy banks, and people's credit funds. At the end of 2013, there were only 4 banks with total assets of over USD 10 billion and all banks were dominated by the state. 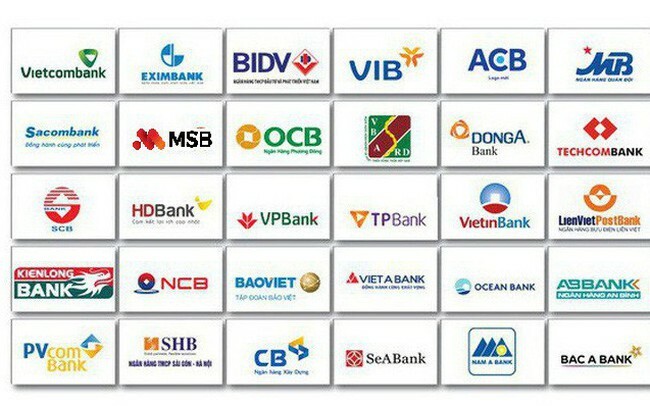 However, by the end of 2018, this number had reached 11 banks including: BIDV, Agribank, VietinBank, Vietcombank, SCB, Sacombank, MB, ACB, SHB, VPBank and Techcombank. In particular, BIDV and Agribank have the largest total assets, reaching over VND 1.3 million. These 11 names are very influential in the market when it is estimated that the market share of deposits and credit over two thirds of the market, is increasingly isolated from the small banks behind. 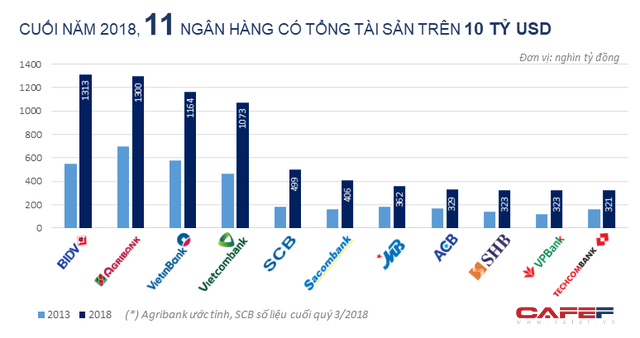 SCB, VPBank, Sacombank, BIDV and Vietcombank are the 5 banks with the fastest total asset growth in this group, up 176%, 167%, 152%, 139% and 129%, respectively. While total assets increased exponentially, equity and chartered capital of banks increased slowly. By the end of 2018, the total equity of the credit system reached more than VND 806 trillion, an increase of over VND 339 trillion, equivalent to 73% compared to the end of 2013. In which, equity of financial companies, Financial leasing increased the most with more than 10 times. And state-owned commercial banks have the slowest increase in capital (up 59%). In 5 years, the charter capital of the system was added more than 152 trillion, equivalent to an increase of 36%. Accordingly, at the end of 2018, the total charter capital of the entire credit system reached over VND 576 trillion. In particular, the charter capital of joint stock banks is the largest and also increased the fastest in the last 5 years (up 38%). However, there is a clear differentiation in joint stock banks. Top banks such as VPBank, Techcombank, MBBank, ACB, ... have many advantages in raising capital thanks to impressive business results, good growth in stocks and investors' interest. foreign. Meanwhile, a series of small banks with chartered capital around 3,000 billion dong are still struggling to find a way to raise capital but are stuck. The increase in total asset size was too fast while the added charter capital was not timely, leading to the minimum capital adequacy ratio (CAR) tending to decrease in many credit institutions. At the end of 2018, the CAR of the whole credit institution system was 12.14%, of which the state-owned commercial banks only reached 9.53%. The group of joint venture banks and foreign banks still maintained CAR quite high, reaching 23.88%. The low capital adequacy ratio of Vietnamese banks poses many challenges and is considered a bottleneck for the growth of the whole system. According to a VDSC report, CAR of the Vietnamese banking system is at the lowest level in the ASEAN region. Add: No. 66/2 DT 743 Street, An Phu Commune, Thuan An, Binh Duong Province. Add: 125, Street 8, KCD Nam Long, Tân Thuận Đông Ward, District 7, HCMC.